Michele Tallack was born in London and after a childhood spent mostly in France, Italy and the Netherlands she was educated at Guidford School of Art and the University of Cambridge where she took an honours degree in Art and Education. After graduating, she lectured in the History of Art at the University of Cambridge snd at Anglia Ruskin University, Cambridge. She has acted as consultant to the U.K. Department of Education on art education and was funded by the Arts Council of Great Britain to devise and run courses for artists wishing to work as artists-in-residence in schools. She has published on art education, particularly on the benefits of using artists in schools to broaden pupils' understanding of the arts and ways in which different cultures contribute to artists' work. 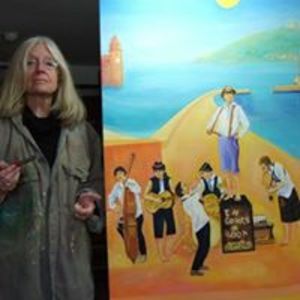 She has been a professional painter all her life, working in England, the Bahamas and France and has works in private collections in these countries as well as the U.S.A.